FROM the hospital atrium to the theatre foyer a rare form of cancer is taking centre stage. 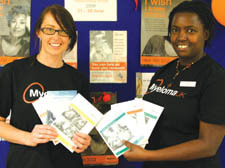 Specialist nurses handed out leaflets at the Royal Free last week to raise awareness of myeloma, which attacks plasma cells, the body’s defence system in the blood. And tonight (Thursday) playwright Amy Rosenthal, daughter of comedienne Maureen Lipman, is dedicating the gala night of her new play to Myeloma UK. Tickets cost £40, including pre-show and interval drinks and canapés, and a post-show discussion.